Welcome to Wolf Pack (Hunting For A Cure)'s SOY Fundraising Page! 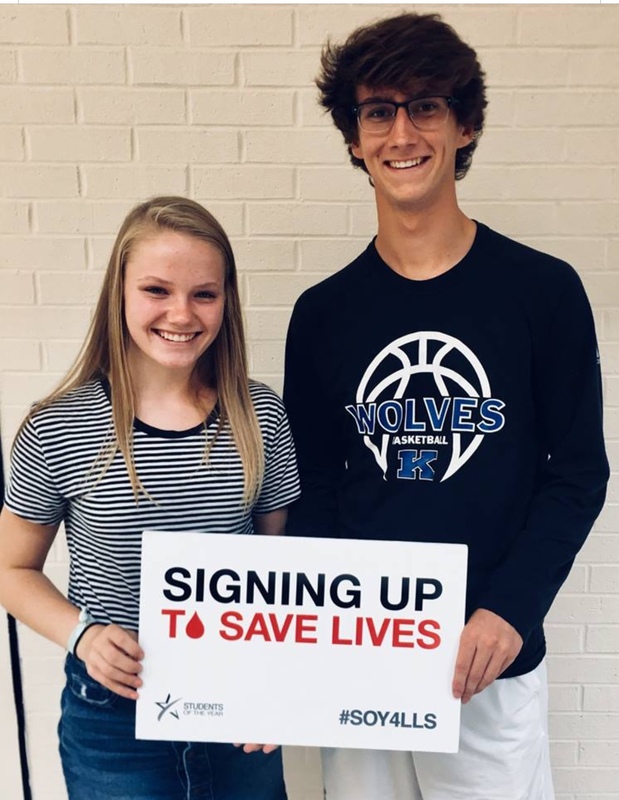 The "Wolf Pack" is honored to participate in the 2019 Students of the Year program, a seven-week initiative in which select high school students from around the country participate in a fundraising campaign to benefit The Leukemia & Lymphoma Society. We are proud to be "Hunting for a Cure" in memory of Jimmy Sauder's grandmother Suzanne Ritter, who had MDS and in honor of Megan Grimshaw's grandfather Jim Jones, who has CLL. We are also honored to have three blood cancer survivors on our team! Please contact us at wkhswolfpack@gmail.com with any questions. Thank you! Sunday, February 10, 4:00pm : Yoga Class at Worthington Hills Country Club: 920 Clubview Boulevard South, Columbus, OH 43235. Join us for a donation-based, vinyasa-style yoga class taught by one of our favorite instructors! Please bring a mat. Note: this class is open to the community. You do not need to be a member of WHCC to attend. Wednesday, February 13, 10:30am-10pm: City Barbeque Dine to Donate fundraiser: 3758 W. Powell Road, Powell, OH 43065. City Barbeque will donate a portion of sales to our LLS team. Be sure to mention our fundraiser at the register when you check out! Wednesday, February 20, 6-8pm: Happy Hour at House Wine:644 High St, Worthington, OH 43085. House Wine will donate a portion of sales to our LLS team! 1550 Lewis Center Road, Lewis Center, OH 43035. Imagine a world without cancer as you discover how the new community being built at Evans Farm defines New Urbanism. 7020A Huntley Road, Columbus, OH 43229. End where our campaign began enjoying Zaftig craft brew with a Cousin’s Maine lobster roll made famous as a winner on television’s Shark Tank! Friday, March 8: Grand Finale Celebration: hosted by the Leukemia and Lymphoma Society. Join us to celebrate the Wolf Pack, other Central Ohio teams and our accomplishments! Tables are available; please let us know if you would like to sponsor a table or would like to join us at one of our existing tables. Program ads are available starting at $250 for a half-page ad. Corporate partnerships are also available - please let us know if you would like more information. Wolf Pack T-shirts: T-shirts are available featuring our Wolf Pack logo. Gray with the orange logo shown. Please let us know if you would like to purchase a t-shirt. Good luck Team Wolf Pack! Very proud of you and your work for this important cause. Great job Megan and rest of the Wolf Pack! You are all doing something incredible! Happy to support my amazing nieces!! You can Massachusetts off your list!! With love and celebration for the life she lived and the example she set for everyone who knew her. Love your Uncle Paul's creative match system to help you out! Good luck on getting all the states!!! So incredibly proud of the work of Team Wolfpack. Well done! Great job!! Happy to donate to such a great cause! Thank your Uncle Mitch! Good luck! From AVID Wolves for a cure team in Kansas!! thanks for all your hard work! You are doing a great job! House Wine was happy to host your fundraiser. We are pleased to be able to give back a portion of the proceeds. Go Wolf Pack! Thank you for all your efforts to support the LLS. So proud of you! Happy to pledge in honor of my dad who is battling non Hodgkin’s lymphoma-thanks for supporting this very worthy cause! The Toy Barn appreciates your efforts to support LLS. The effort your group has put into this cause is above and beyond. Happy to help, Brady Cloyd. Keep up the amazing work Team "Wolf Pack"! Proud to support such an important cause! Good Luck Megan and Jimmy! Such a wonderful cause! Keep up the great work! Great event at the Toy Barn. Keep up the good work. I hope your team exceeds it's goals, and the money generated helps greatly in treating, and discovering new treatments for all affected by cancer. Great job Megan! So proud of you! Missing you and the fam from here at college. I'm so proud of you! Honored to support what The Wolf Pack is doing! Great job! Great job Megan, here is to Uncle Jim AKA Papa!